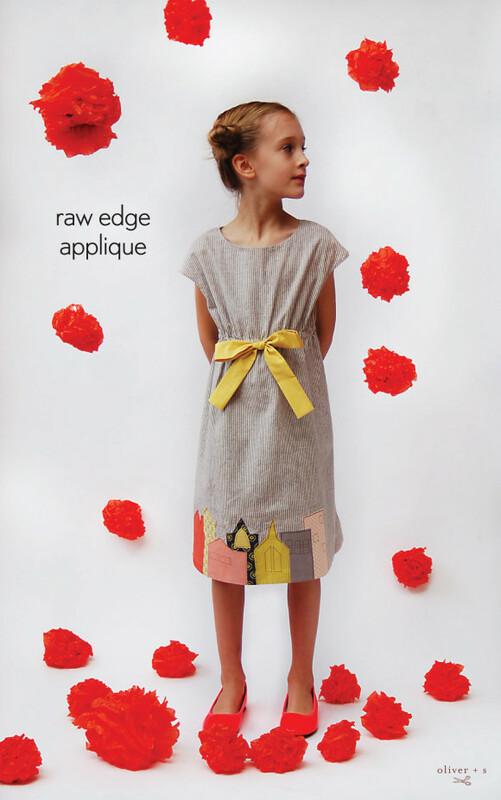 Raw-edge applique is about as fast and easy as applique gets. If you haven’t tried it before I think you’re going to like it because it’s a lot of fun and because you can do some seriously cute things with it. 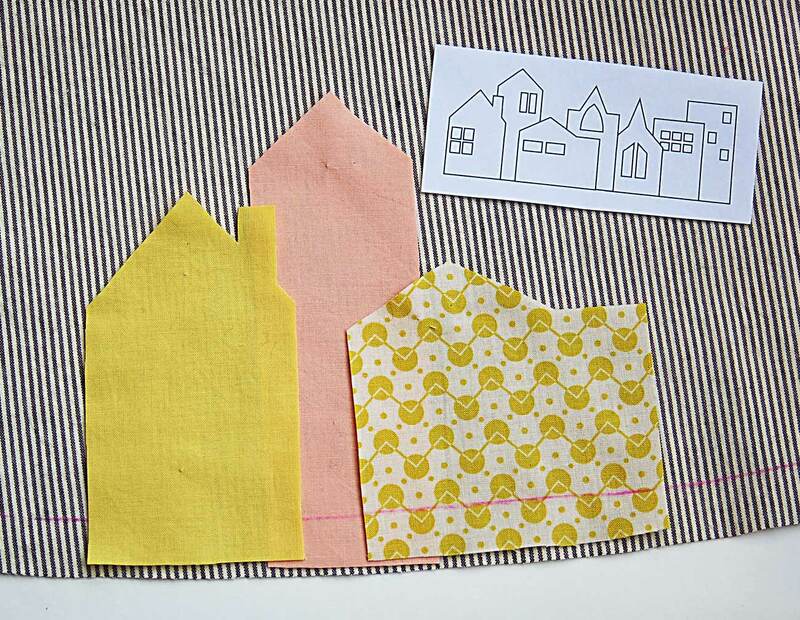 I designed these little houses for S’s Roller Skate Dress. I had such a good time doing it that I thought you might like to give it a try too. 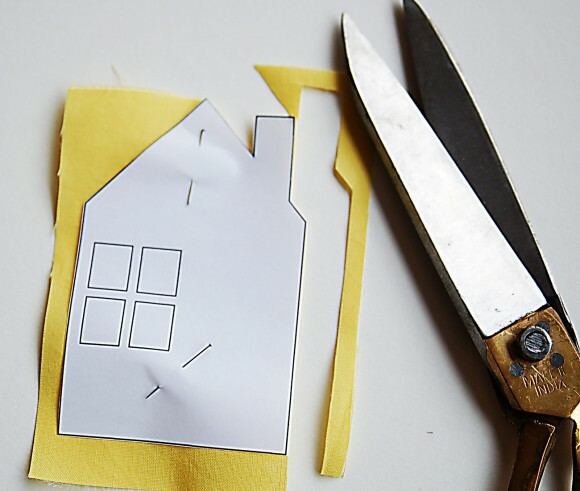 I’ve created a template that you can download and use to make the same little houses, and I’ve written up a tutorial about how I did it. But don’t limit yourself to these houses. 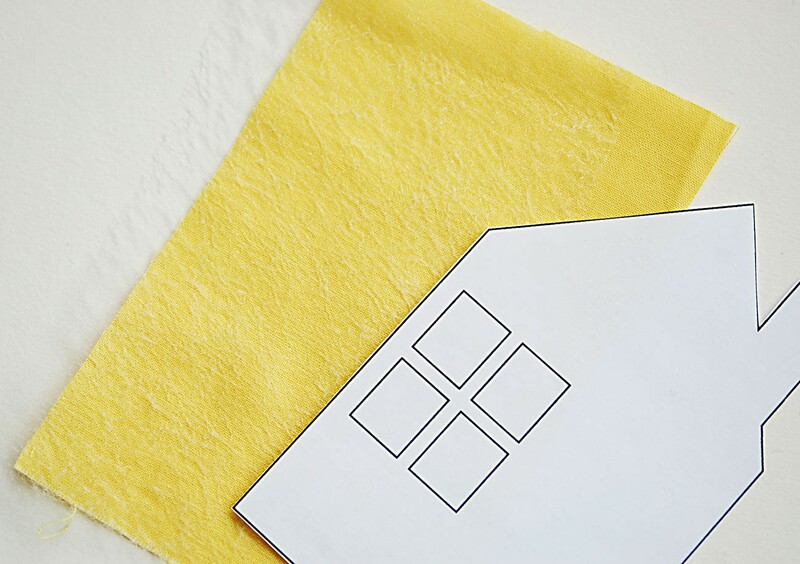 Once you know how to do raw-edge applique, you’ll be able to design your own applique, too. For this project you’ll need your dress fabric, some coordinating or contrast scraps for the houses themselves, fusible web (I’ll talk about that shortly), a non-stick pressing sheet (I’ll also talk about this), and thread. 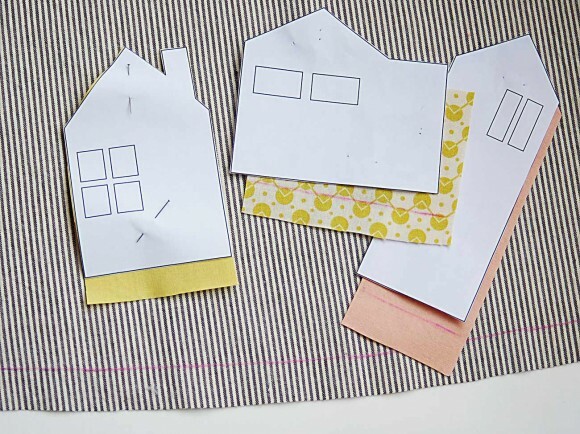 You can print out the house templates here. Feel free to re-size these as desired. If you print them at 100%, that’s the size I used for S’s dress (which I made in a size 6 and lengthened). 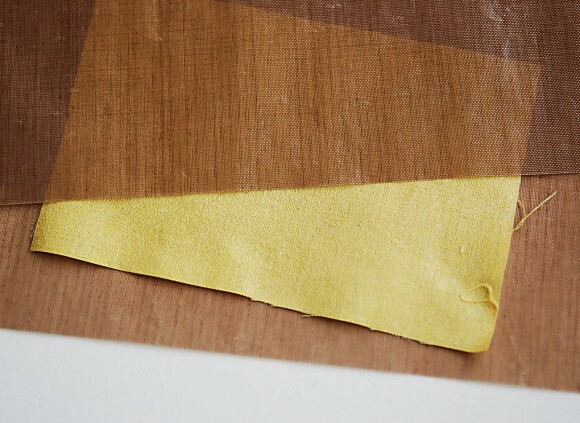 You’ll also need a silicone-based pressing sheet. If you have silicone-coated baking parchment in your kitchen, that’s perfectly fine to use. But Mistyfuse also makes these fantastic Goddess Sheets that I’ve been using for a while now and adore. The Goddess Sheet is a non-stick pressing sheet, so you don’t gunk up your iron when you’re working with interfacing or fusible adhesive, and nothing gets stuck to anything that it shouldn’t get stuck to. You know what I mean. I use mine all the time now. I was asking Iris about it, and this is how she described it to me in an email: rich teflon coating over a really lightweight fiberglass–for fast and even heat transfer and very high temperature tolerance. Sounds delicious, yes? I’ve been threatening to get rid of my Silpat baking sheets and our panini press and just use Goddess Sheets for baking and panini making instead. In our tiny New York kitchen, any product that saves space is a gem. We’ll get back to panini shortly, but Goddess Sheets are designed for the sewing room, so let’s talk about applique, shall we? 1. Start by cutting out all the pieces of your Roller Skate Dress. It’s easiest to do the applique first and construct the dress when the applique is finished. You can also add applique to a finished dress, but it’s almost always easiest to work flat, with no seams or corners to work around. 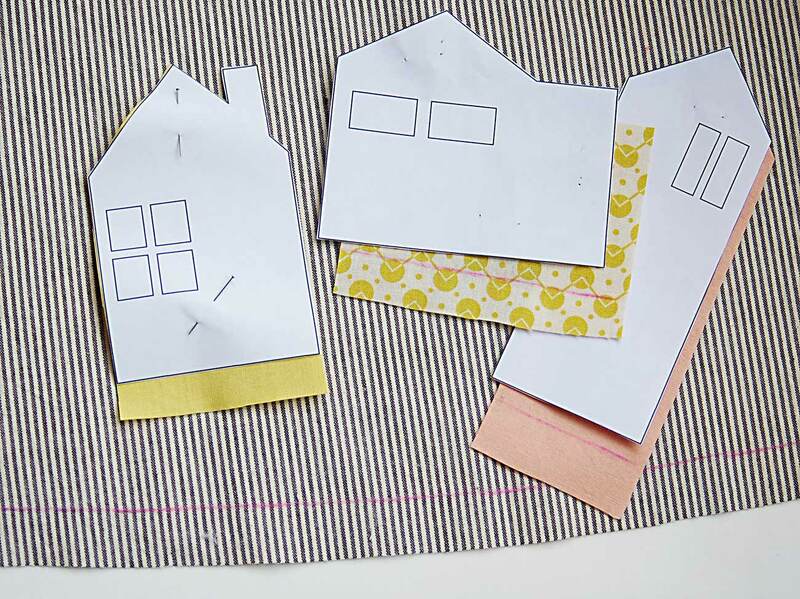 Print and cut out the house applique template pieces, and then cut a piece of fabric and a piece of Mistyfuse a little larger than the template piece for each house. If you’re planning to applique the houses at the hem of the Roller Skate Dress, like I did, be sure to leave a little extra fabric (and Mistyfuse) at the bottom of each house template piece. You’ll see what I mean and why I do this shortly. Can you see the Mistyfuse in this photo? It’s so fine that it’s difficult to photograph. 2. Place the Mistyfuse on your Goddess Sheet, and position the fabric, right side up, on top of it. Then cover it with the Goddess sheet. So the Goddess Sheet is the bread that wraps around the fabric and the Mistyfuse, and the fabric and Mistyfuse are the fillings in your sandwich, ok? Heat up your iron and give this sandwich a good press. I guess that makes our sandwich into a panini! You’re melting the fusible web to the fabric so one side of your fabric has glue to attach it to your dress fabric. Let the Mistyfuse cool, and then peel the fabric off the Goddess Sheet with the Mistyfuse attached to the fabric. The Mistyfuse side will look a little shiny, like this, if you can see it. 4. Use chalk to draw the finished hem line on your dress, too. For the Roller Skate Dress the hem seam allowance is 5/8″, so your chalk line will be 5/8″ from the cut edge of the hem. 5. Now you can refer to the little diagram on the house templace, if you want, showing which houses go where. Or arrange them however you like, layering as desired. As you’re arranging, be sure to take into account the seam allowance at the sides of the dress panel so you don’t end up with dresses in the side seam. I started my houses about 1 1/2″ from the side seam, but do what feels right to you. 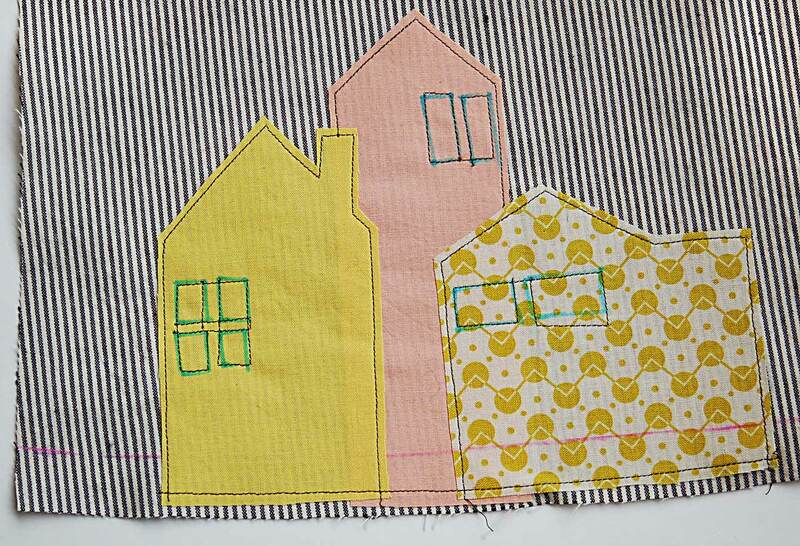 Line up the chalk lines on the bottom of the houses with the chalk line on the dress hem so the excess fabric below each house will be in the hem seam allowances. 7. Edgestitch the houses in place to give them a nice, defined edge. 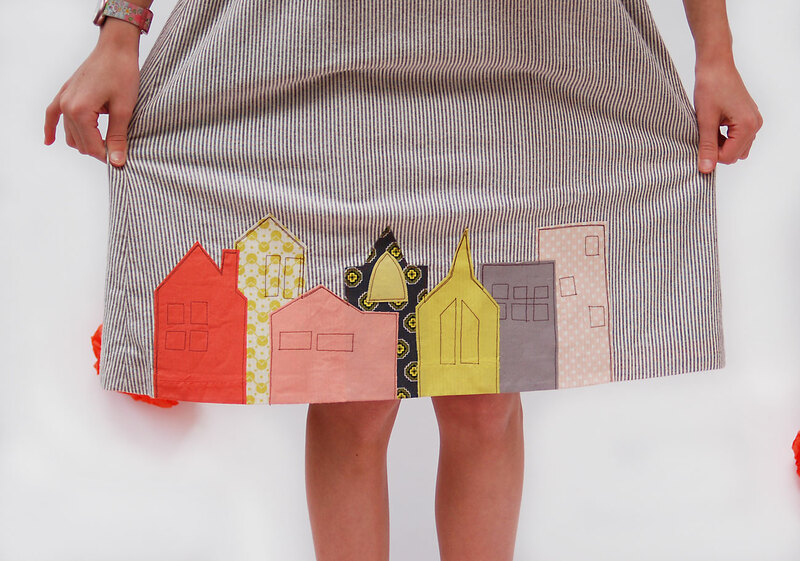 I used brown thread because I wanted the houses to look like they were drawn onto the dress. I like to edgestitch loosely, not worrying too much about staying straight, because I think it’s part of the charm of this design. 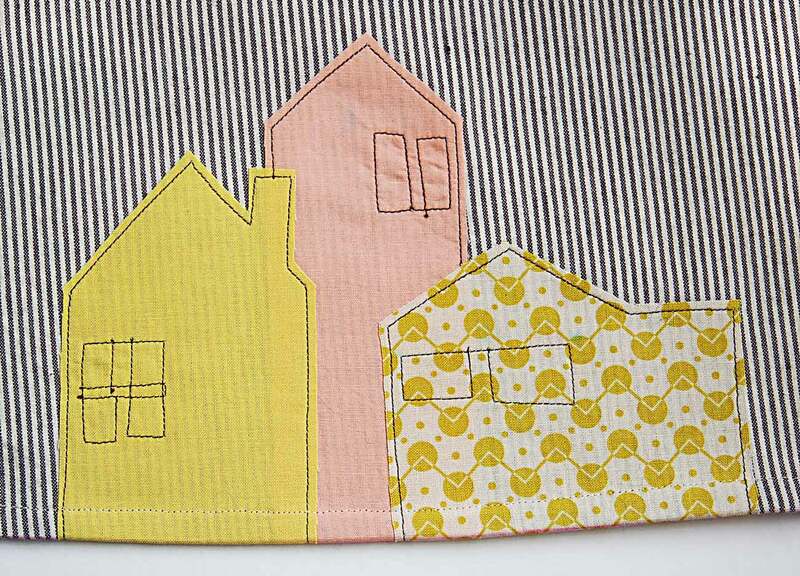 You can also use the house templates to draw the windows and details with chalk, and then machine stitch over the chalk lines to finish them. If your machine has a needle down and a lockstitch function, both of these options will come in really handy for these bits. 8. Any other details you’d like to add? Go for it. Use the same raw edge applique technique, or maybe you’d like to hand embroider a sun or a cloud somewhere on the bodice? And that’s really all there is to it. Sew the dress the way you normally would, and when you finish the hem of the dress the bottom of the houses will get turned to the inside of the dress. How fun! Thank you for the how-to! I’m thinking some similar sweet houses may have to spruce up my spring wardrobe. 🙂 I love the colored houses on the striped background! I think I will take my silpat and wash it but good. Then down to the ironing board it goes! But how sweet and easy! for the dress did you use seersucker. I love this dress. Julie, this fabric is a woven yarn-dye stripe (meaning that the yarns themselves are dyed instead of the stripes being printed on top of the fabric) that is heavier than a quilting cotton but not as stiff as a ticking stripe (like old-fashioned mattresses). I wish I could remember where I got it! I’ve had it for a while. 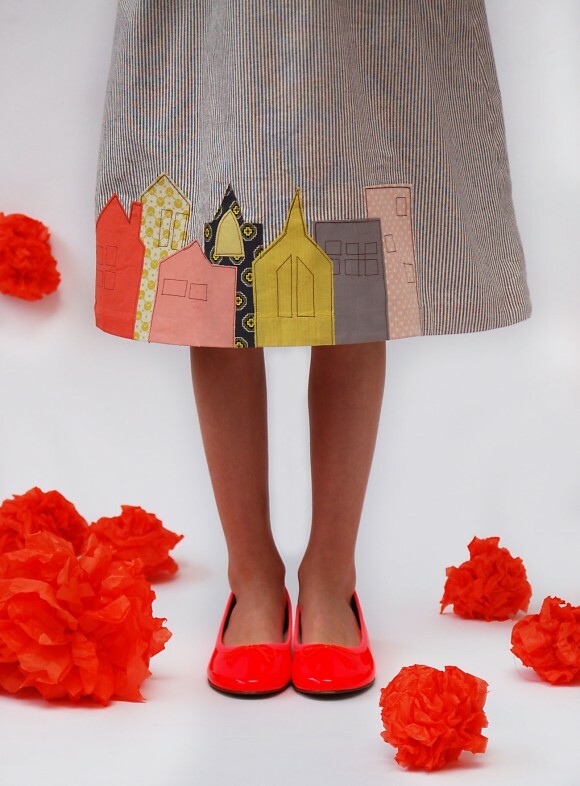 I probably wouldn’t recommend doing the raw edge applique on seersucker simply because the puckers in the fabric wouldn’t adhere to the fusible web very well, but seersucker would be a great fabric for this dress otherwise! This is so inspiring. I am going down to the studio to get started now. Will post pics when I’m done. Great tutorial. I will be using it on the bottom of my grand-daughter’s skirt. Truly appreciate learning from so many great seamstresses. Thank you for all your help! Sooo cute!! Is it okay to use this pattern for commercial use? Or is it personal use only? Thanks! Jessica, all our patterns are sold for personal use only. I love these appliqués. It is funny to see all these appliqués today. 40 years ago I did all that to my 2 girls and today I do the same for my 2 granddaughters. That is why I love sewing for children I create stories on there clothing with the appliqués and they love it. Would you please tell me how many pages to download the baby layette patterns has? Also, must you choose only one size or does the pattern include multiple sizes?